In 1970 the Pony Car War reached a flashpoint with the introduction of the Dodge Challenger and the redesign of the Plymouth Barracuda. This new E-Body class was created to compete directly with the Chevrolet Camaro and the Ford Mustang. Competition took place not only stoplight-to-stoplight or on the quarter-mile dragstrip, but also in the Trans-Am road racing series. Dodge and Plymouth each fielded race cars in this series and were relatively successful for their first year with a factory-backed racing team – earning 4th in the standings by the end of the season. 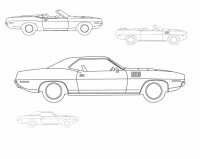 The E-Body represented the golden era of the muscle car, born immediately before emissions and safety standards all but removed these models from existence.